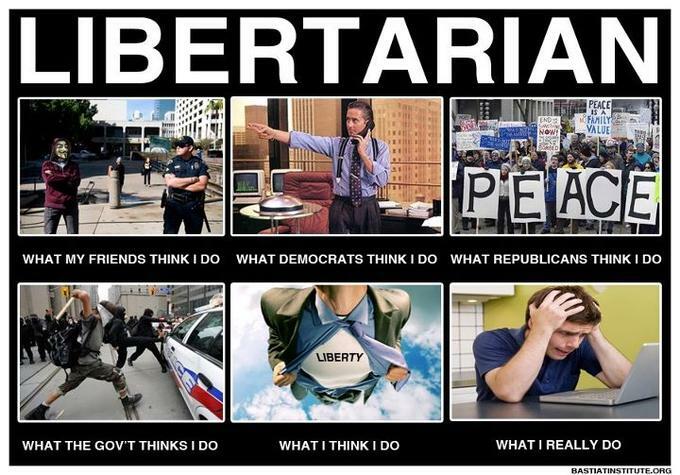 Simple Facts and Plain Arguments: Are You A Libertarian? I happen to have a sneaking suspicion that most rational people are closet libertarians. Unfortunately, there are a lot of ridiculous and false claims about libertarianism that only serve to turn people away from it. Depending on who you read/watch, we liberty-lovers are either a bunch of bisexual, pot-smoking, tinfoil-hat-wearing, flag-burning, closet-Democrat, almost-terrorist, troop-hating hippies that still live with mom and dad; or a bunch of angry, flag-waving, closet-Republican, gun-toting, Koch-funded, tinfoil hat-wearing Gordon Gecko wannabes who like to shout at walls a lot. Are better results obtained when people do things voluntarily than when they are forced against their will? Yes? Well, libertarians love when things are voluntary. Love. Should people be left alone to do as they please within their rights, provided they don't interfere with the rights of others? In other words, is "harm none, do what ye will" a good idea? Did you say yes? If you didn't, you may need counseling. Should America have 160,000 troops spread out all over the world with military bases in over 150 countries? Should we be indiscriminately bombing innocent people in other countries in search of boogeymen that we created? No? What?! You must either hate the troops or love the terr'ists, then. Should businesses be allowed to hire whomever they please at whatever rate they can agree upon? Should they be able to sell their products or services to whomever they please at whatever price customers are willing to pay? Yes? Obviously you're getting paid by the Koch brothers. On the flip side, should any industry or business - from corporate giants to corner stores - be propped up or rescued from their own mistakes with money stolen from you and I by friends of said industry or business? Should incompetence and greed be rewarded with tax dollars? Sure, right? I, for one, hate having extra money in my pocket. I'd much rather it go to Goldman Sachs or GM so their executives can spend it all on hookers and blow. Is it okay to use aggressive force against an innocent person?